غفاری قره باغی, سید احمد. (1391). Survey and Critique of First Intelligible and Secondary Philosoph ical In telligible in Transcendental Philosophy. دوفصلنامه جاویدان خرد, 08(19), 31-54. سید احمد غفاری قره باغی. "Survey and Critique of First Intelligible and Secondary Philosoph ical In telligible in Transcendental Philosophy". دوفصلنامه جاویدان خرد, 08, 19, 1391, 31-54. غفاری قره باغی, سید احمد. (1391). 'Survey and Critique of First Intelligible and Secondary Philosoph ical In telligible in Transcendental Philosophy', دوفصلنامه جاویدان خرد, 08(19), pp. 31-54. غفاری قره باغی, سید احمد. Survey and Critique of First Intelligible and Secondary Philosoph ical In telligible in Transcendental Philosophy. 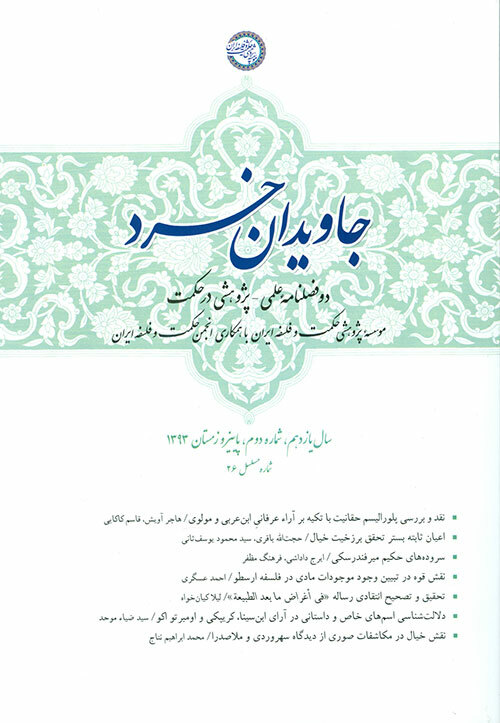 دوفصلنامه جاویدان خرد, 1391; 08(19): 31-54.